FACTORY: Tobacalera La Alianza S.A.
Logan Lowler of Cigar Federation got together with Crowned Heads to develop this cigar to celebrate the birth of his daughter. The main goal of the stogie was to be approachable for a novice smoker, but also complex enough to capture the seasoned aficionado. "729" is Logan's daughter's birth date. "Calloway Lane" is Logan's daughter's name. So ... I'm usually a huge fan a minimalist design. I dig the singular green band - it's clean, iconic, and .... well ... forgettable. Specifically, we all have humidors full of sticks. 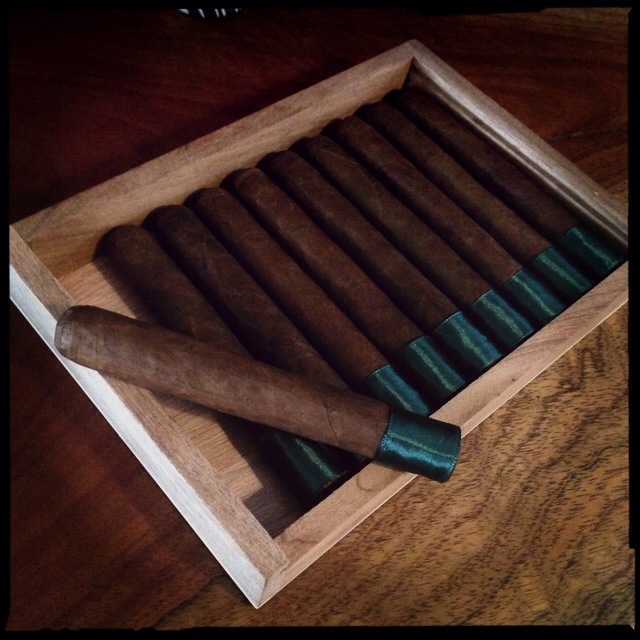 I don't know about you - but sometimes I need the gentle nudge to remind what's what in that jungle that's my cigar collection because eventually, if you only have a green band - someone else will do the same thing (cough ... JW Marshall) and everyone will be confused. 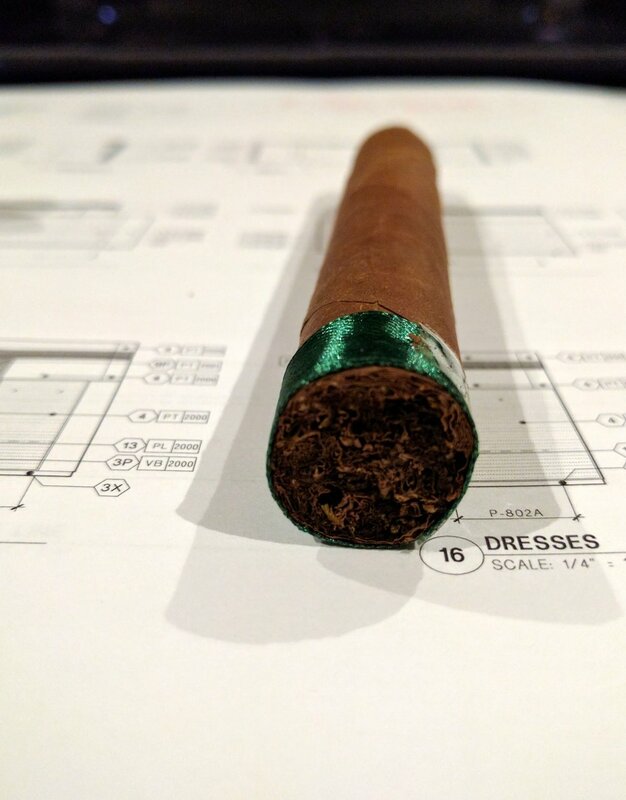 Additionally, cigar bands are meant to be inspired by the creative process behind the cigar's development or indicative of what the brand represents. Logan/Crowned Head's had a beautiful event to commemorate and the best they could do was a plain, green foot band. I have to say - try harder. There is no doubt, this is a superbly made cigar. The Habano wrapper is smooth with the exception of one big vein running down two-thirds of the body. It's almost hard to find the seams! You can tell from the foot that this is a well constructed stick - everything looks tightly rolled and orderly. The cap is perfect and held excellently once I sliced it. This stogie is clearly made with some pride for sure. Smells light and fresh. There is something herbal I can't quite identify. There's a citrus-y, fresh-cut lumber smell that's fantastic. Firm with some give - I placed in my humidor for the past couple days, but trust u/stogie-bear took good care of these. There is something forest-like about the cold draw. Maybe mossy or wet wood with a hint of smoke. The musty, aged tobacco is prominent. I used a single flame butane torch to get it going around 11 PM (I'm a night owl - only time to myself with one toddler and a 6-month old!). Initial draws are pleasant with a good amount of smoke right off the bat. Very smooth, creamy with sweetness lingering on the tongue - almost like honey or milk. Goldilocks - Just right. Not too much, not too little. Great white, flavorful smoke. Impossibly mellow and chill. Great notes of vanilla married with some caramel latte. The musty wood is all but gone. Already, I wish there were boxes still available. The burn line is raggedly but consistent. Smooth profile continues. Vanilla continues with some subtle pepper and spice. Cigar Fed's description noted nuttiness and it's not wrong - the nuttiness is not overt and I could not place a specific nut, it's more more of a the dryness of eating some pecans that I'm picking up. I ran into some minor issues keeping it lit. I'm usually a fairly aggressive puffer but after a minute sitting on its own, I had to re-light a couple times. The burn line corrected to be very even all the way around. Smoke production is still fairly high on the draw but non-existent when laid down. Speaking of the draw, it's fantastic - almost no effort. Did I already say smooth? The sweet, creaminess is still ever present but there's more complexity now. As I worked it down to the nub, there was a little more earthiness to it - much more meaty than it started. This one creeps up a little in terms of strength. As it builds, it definitely is on the high side of medium strength. A CIGAR FITTING FOR A BIRTH.